Somewhere in the crazy sweaty hotness of my July, I missed a post by Aquarium Drunkard about a new Africa-influenced collective from his ‘hood of Los Angeles. Fool’s Gold is a mixed group of folks sometimes numbering near a dozen players, who are inspired by a shared love of Congolese, Ethiopian, Eritrean and Malian music and American dance-pop. After seeing Mali’s Vieux Farka Touré (son of Ali) play the college where I work earlier this week in a joyous free show, this just feeds the nascent hunger in my belly for these heady, cyclical, pulsing rhythms. From the insistently exotic opening notes, I am intrigued. Their self-titled album is out Tuesday (9/29) on IAMSOUND Records, and the whole thing is a perfect burst of warmth to this Indian summer i’m gettin’ this weekend. 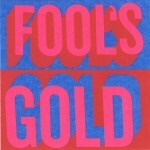 Fools Gold- Suprise Hotel vs. Air France- Beach Party? Thats a tough one…similar songs….I think I’ll go with Air France. Found your site just now- Really nice, thanks!